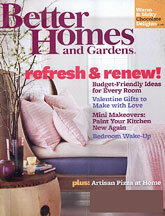 Get a free subscription to Better Homes and Gardens from FreeBizMag. Fill out the required information, select your magazine then enter your delivery information. Please allow 4-10 weeks for delivery.